I enjoy working with the ephemera of the Ragtime Archive in Sedalia and, as a diversion, I work with my own accumulation of personal scrapbook treasures. As I was blowing off the dust from some old family papers and photographs today, I realized my two projects often converge. I am fascinated by modern efforts to preserve and present the music I heard at home when I was growing up such as: Rich Conaty’s Big Broadcast programs from 1973 until his death last year, Bryan Wright has just shared his 77th Shellac Stack podcast, Glenn Robison’s Rapidly Rotating Records has been on KISL-FM 88.7 from Santa Catalina Island, California for 17 years, and Andy Senior’s Radiola webcast has informed and entertained since us 2005. Today we have wonderful documentaries about the early days of radio and the recording industry. However, the way audiences enjoyed and wove popular music into everyday living seventy years ago is as fascinating as those early processes of broadcasting and recording. Today with modern audio technology music is portable and we listen through sophisticated earbuds. 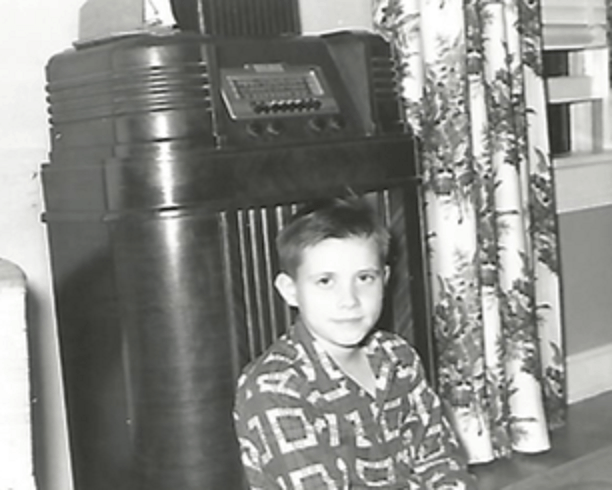 When I was a kid, recorded music wasn’t portable so for portability, we carried it around in our heads. My family was probably typical. I grew up listening to my Dad’s big band records and in the evenings the old radio shows were our entertainment after dinner. Even in households without musical talent like ours we knew the lyrics and hummed or sang along loudly to overpower the recorded artists as if we were part of the show. It was sort of living room Karaoke. I could tell an orchestra by its sound and selections without the need for a disc jockey or record label when I was a kid. Thanks to post World War II technology, we were immersed in the music of the early 20th Century. My Dad was a great fan of Ted Lewis and “Me and My Shadow” was usually on his personal playlist. I knew the words long before I understood the loneliness of that old standard. My Mother liked the crooners and Dad favored the big orchestras so we had a lot of big band vocal selections among our 78s. And that brings me to the convergence of what I’m doing these days. I realized that some of the archival material I’m preserving was originally an important part of my life as a child in the 1940s. Specifically, receiving Bryan Wright’s recent Rivermont Records release of the Ted Lewis CD Runnin’ Wild was my reminder. I recently found the script from a 1949 act my Father and I did for my grade school PTA talent night program. We opened with a “Me and My Shadow” routine replete with homemade Lewis-like top hats, canes and cummerbunds. I was the shadow of course and just barely managed to stay in step as we strolled around the stage to the music. A group of fathers made up a small on-stage band and I had my 15 minutes of fame that evening. (My sand-floor soft-shoe was the only time in my life I didn’t stumble over my feet.) Dad’s corny “Vaudeville” routine was a hit, too. By then the old stage song and dance acts and slapstick comedians he copied had gravitated to radio and were on the verge of breaking into television. Our talent show routine was as primed to be a hit that evening as Sedalia’s Scott Joplin Ragtime Festival was destined for success in 1974 after The Sting came out. As I listen to the old recordings today, I like to imagine both the performers as they played and sang and also to remember how I sat in front of the old Philco console radio, transported in musical ecstasy back to my 15 minutes of fame as a nine-year old performing as Ted Lewis’s, uh, Dad’s shadow. Next time you listen to an old recording, imagine not only the performers but the listeners. If you are my age, memory will enrich your imagination. If you are too young to remember, create your own connection to the music of my radio days…you will be entertained for a lifetime. Larry Melton was a founder of the Scott Joplin Ragtime Festival in 1974 and the Sedalia Ragtime Archive in 1976. He was a Sedalia Chamber of Commerce manager before moving on to Union, Missouri where he is currently helping to conserve the Ragtime collection of the Sedalia Heritage Foundation. Write him at lcmelton67@gmail.com. Scott Joplin’s Treemonisha: The First Stagings Remembered.